Just a warning: this post isn’t going to be strictly movie related. I don’t care if you don’t like it. I am not sure what the main population knows about my adopted town, so I will start off with the basics. If you follow college football, then you have heard of UGA and the Georgia Bulldogs. They dominate SEC championships and this town every football season. And by dominate, I mean overrun. UGA is already a prominent fixture in this town but once you add insanely loyal fans, alumni and drunk freshmen you get a town that is filled with red and black. These times are when the town is at it’s worse. (Especially if you work in the hotel business, like I do) But once these weekends come to an end, the town becomes something else entirely. For people who know the history of alternative rock, then you probably have also heard of this town. Or more likely the music that has come out of it in the late seventies and then again in the late nineties. REM, the B-52s, Widespread Panic, Drive-By Truckers, Of Montreal, Neutral Milk Hotel and a host of other alternative bands all have their origins here. The music scene is so vibrant here that it can maintain ten music venues of various sizes and specializations. These are just music venues that are open only when they are playing music. I am not counting the coffee shops or bars that sometimes feature music as well. For those of you that live in big cities and scoff at the notion of only having ten music venues, let’s compare a similar town in Illinois. Champaign, Illinois is home to University of Illinois, a respected university with a good basketball team. It has two music venues that are constantly changing hands and are on the verge of closing despite having the same population and the same economy. So suffice it to say that music is a huge deal here. Every night there are at least a few shows you can see, but on weekends the music scene explodes. For relatively cheap prices, you can see a nationally touring band, a local experimental band or a folk trio all in one night. A good deal of the locals are musicians that support themselves with mundane day jobs. So it is likely that the person checking out at the liquor store or making copies for you at the Kinkos could also be in a band that you have enjoyed the previous weekend. Not only is music a big deal here, but art of all kinds are shown preference. This town has an art cinema, several art galleries, art museums, artisan food, and an amazing Botanical Garden. We also have two breweries (one that has been established here for a long time and one that just opened), two coffee makers, and several nationally ranked restaurants (with two being run by a Top Chef winner). When I first moved here, I hated it. We moved here blind with no friends, job prospects or concrete plans for the future. It was hard to adjust to not only new surroundings, but also having no money and no one to commiserate with besides each other. Once I found a job, I was able to get out of our small apartment and explore the town a little more. I slowly acclimated myself to this town and found my favorite coffee shop, bar, restaurant, and book store. As I got to know the people around me, I found that these people transcended my preconceived notions of what a Southerner is. Despite many of them having silly accents (at least to my ears), many of them were just as progressive, weird, and art minded as I was. I had more conversations about the nature of art here than I did while I was studying at my undergrad school. 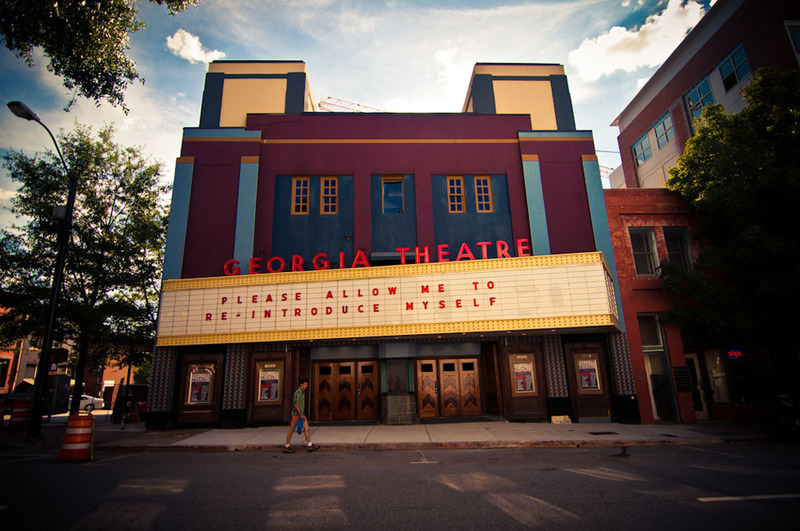 While Athens, GA is not a totally faultless town, I have come to love it thoroughly and completely. It has become my adopted hometown and the place I would recommend to anyone that wanted to move to an art centered town. At the end of this summer, I will be leaving this place to continue on my adventures elsewhere and I am seriously bummed out about it. I will no longer be able to wander the streets I know so well or eat my favorite falafel sandwich or drink 1000 Faces coffee. I will no longer be able to strike up light conversations with my favorite baristas or bartenders.I will no longer enjoy sitting at an outside table lazily drinking a Terrapin beer while I overhear conversations about physics, natural selection or Plato. I hope I will be able to find a place to call home in the next town a I venture to, but it will never compare to the good times and great adventures I had here. I will miss you Athens, GA. I give you a big bear hug.